Editor’s note: I use “he” because “he or she” can interrupt the flow of sentences. But abuse can happen to any gender. An emotionally abused child may sometimes feel like a ghost in his own home. He passes through its corridors, affects its surroundings, interacts (as best as he can) with the other people in the house… but he feels like no one quite sees him. People outside the house can see this child. And from the outside, these neighbors, family friends, relatives, and teachers may see this gleaming, shiny family, paragons of the community, and believe that all children in this family are loved and nurtured, their emotional, spiritual, and physical needs met. But when the blinds are closed, when the front door’s shut, when all the windows are sealed up, and the parents have resumed their natural form, the child disappears in front of his parent. The child feels so lonely, so very unimportant to anyone. Because home should be a place of nurturing, comforting, loving, growing, and playing. But for the emotionally neglected child, home is where you aren’t seen or heard. Home is the place you haunt. And your parents only notice you when they want something from you. Not any other time. Emotionally abusive parents are not always noisy gongs, overly boisterous buffoons, yelling caricatures. Some of them hurt their children by emotionally neglecting them. Abusive parents do not know, care, or understand their child. They rarely know what the child likes or dislikes, how the child reacts to things, etc. The parents only know (and care about) what makes them (not their child) happy, and they see their child through a self-reflective lens. Dad buys a sports jersey for his child on his birthday. But the child doesn’t like sports or the team, and has told this to his father. The father does. So, the father gets royally pissed off at child for not appreciating his token of affection. The father never thought to dip into his knowledge about his child and purchase something that the child would love, not the parent. Mom takes her child to acting classes because the child has such a natural talent for it. Oh, wait, no. The child hates being in front of people, hates performing, and would prefer to be behind the scenes rather than in it. Mom prefers that. The mom never considered talking to the child about what would be fun or discussing some options. It’s always about Mom, never the child. Dad goes to visit his adult son’s house late at night for a beer because he knows how much of a night owl his son is. Wait, no. The son likes to go to bed early and has told his father this. The night owl is Dad, not son. These parents act like the world revolves around them. And that it should always be like that. These parents may talk about their children to others, but they don’t really know their own children. Dad himself is a terrible singer. He can’t carry a tune and knows nothing about melodies. Neither can his child. But Dad wanted to be a great opera singer, and when he sees his child, he sees his dreams fulfilled. Even if they’re not. Mom is incredibly shy and would rather stay home than go out. Her child is neither an outcast nor popular, but the mom can’t gauge when her child how her child feels because Mom wants the child to be uber-outgoing and amazing. Because mom isn’t. These parents make assumptions about their child. They talk lies about their child. They live in delusion about who their children are. Parents should not demand love and approval from their children. Repeat: Parents should not demand love and approval from their children. Good parents love their children and nurture their souls and bodies. These parents know that children are a gift from God and treat their children accordingly, with love, tenderness, affection, gentleness, and guidance. Good parents love their children, and that loving behavior will inspire their children to love them back. But good parents don’t demand that their children fill up the holes in their heart or confidence or self-worth. Dad has a big fight with Mom and takes the child out for some ice cream. He tells the kid about the entire fight, demands (whether overtly or subtly) for the child to take his side, wants the kid to tell him that he’s a good person, etc. Dad doesn’t realize that the child is a child. And the child wanted to just have ice cream and play, or to hang out at home and draw. The child did not want to become Daddy’s Little Therapist. Mom is feeling incredibly depressed. Instead of seeking help or taking the right meds (if needed) or calling up a friend, Mom manipulates her child to attend to all her needs, to treat her as if she were a fragile and delicate thing that needs to be pampered. Mom doesn’t care about the child and how that freaks out a kid to take on that role; Mom needs a parent and the neglected child will become that substitute parent. All the above are examples of emotional neglect. That emotional neglect leaves children vulnerable to such terrible relationships and situations. That’s one reason so many emotionally neglected children end up as adult survivors in hard relationships or in tough situations. They often just want someone, ANYONE, to see them to hear them. And they often cannot discern who is toxic to them or who will be a good person. So, they often fall for people who will treat them with the same level of disinterest that their own parents exhibited. However, adult survivors can heal and get to the point where they have emotionally healthy lives. Adult survivors of emotional child abuse can find a better way, a brightly lit path, through counseling, reading about healing, talking to others in a support group, praying, etc. You can heal in time. You can learn to re-parent yourself. If you were an invisible child at home, know that you are not doomed to be forever invisible. Just because your parents lacked the intelligence, compassion, or just very basic human instinct of nurturing their young, that doesn’t mean you aren’t real, that you don’t matter, that you are unworthy. Because you are worthy. As a human being, you have dignity. You matter. Perhaps not to your parents, and that’s a very tragic truth to accept. It’s hard and terrible. Almost no one will understand what you mean when you tell people that your parents are “toxic” for you… but the readers here at The Invisible Scar do. I do. We see you. We hear you. Veronica Jarski is founder and managing editor of The Invisible Scar, a passion project dedicated to raising awareness of emotional child abuse and its effects on adult survivors. She has extensive editorial experience and a bachelor’s degree in journalism. Her work has been featured on myriad publications, such as Kapost, MarketingProfs, and Ragan. 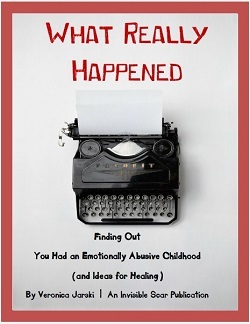 She also is the author of an e-book about waking up to the realization that one had an emotionally abusive childhood. Ads that appear below are created by WordPress and are not endorsed by me. Thank you for writing this. I have been trying to explain this to people for a while now, but no one seems to believe me, or take me seriously (doctors, therapists etc). I’ve been feeling so alone and helpless. The Invisible Scar is a depository of information about the prevention & awareness of emotional child abuse, its effects on adult survivors & ACONs (adult children of narcissists). It is not legal advice nor professional help.